Check out this Stargate-themed cinema room! 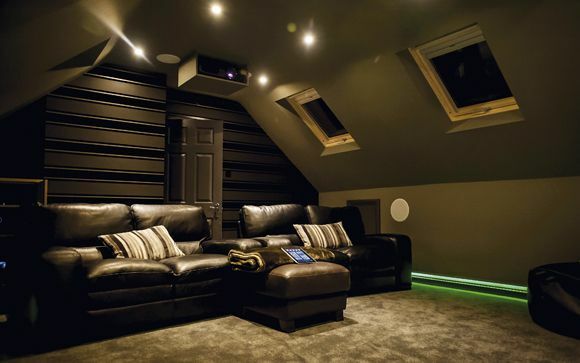 This subterranean cinema room, the work of ET Home Cinema from South Yorkshire, doesn't want to hide its light under a bushel - with the owner adamant that Bowers & Wilkins Diamond speakers were to be used for the front soundstage, there was little choice but to let these stunning-looking cabinets steal the show. If you’re serious about home cinema, you will never be happy with just a living room equipped with a TV and a Blu-ray player, no matter how high quality. The ultimate aim of any home cinema enthusiast must be to own a dedicated media room, designed and built to emulate the theatrical experience. You can pay the professionals thousands of pounds to do the work for you, or you can do it yourself! In Part 1 we discussed some of the basics of a DIY home cinema room project, from the shape of the room itself to the sorts of decisions you need to make about speaker and screen positioning. So, our kind-of-D.I.Y. home cinema project is finished. We’ve taken the sensible route of doing what we could ourselves, and calling on the professionals (builders, electricians and so on) when we came across something we couldn’t (or shouldn’t) sensibly handle. Of course, if you have the money, you can turn the whole job over to a professional installer – but where’s the fun in that? What we’ve learned about specifying, fitting and tweaking a home cinema is just as valuable.